Award-winning English alt-rock, new-wave singer, songwriter, musician and producer. Paul started his career with The Jam in 1972, going on to form The Style Council in 1983 after The Jam broke-up. Weller went on to achieve huge solo success as well as success as an in-demand producer. 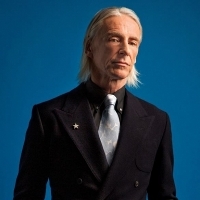 He released his debut album, "Paul Weller" in 1992, followed by: "Wild Wood" (1993), the multi platinum-selling number 1 album, "Stanley Road" (1995), "Heavy Soul" (1997), "Heliocentric" (2000), "Illumination" (2002), "Studio 150" (2004), "As Is Now" (2005), "22 Dreams" (2008), "Wake Up the Nation" (2010), "Sonik Kicks" (2012), "Saturns Pattern" (2015), "A Kind Revolution" (2017), plus 2018's: "True Meanings".